The St. John Memorial and Seine Bight Primary School serves 300 children from ages 5 through 12 years old. The Inspiration Center is a first of its kind non-government organization headquartered in Belize City. It was founded by Mrs. Kim Simplis-Barrow, Belize’s Special Envoy for Women and Children and Global Ambassador for Special Olympics International, in collaboration with CARE-Belize, the Government of Belize and numerous donors and stakeholders. The center provides physical and speech therapy, community based rehabilitation, basic medical services and social support for the holistic care of children with disabilities (birth to 16 years) and their families. Placencia Humane Society furnishes basic pet care items that all Humane Societies need on a regular basis. 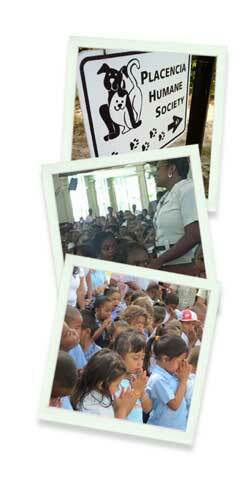 The mission statement of the Placencia Humane Society is “Helping People Help Animals”.